Fast | Thanks a Glatt! Best Kosher Pizza. Period. Well, it comes in a close second to Pizza Sababa on Emek Rafaim in Jerusalem. But as far as the USA is concerned however it is #1. Situated on the first floor of the empire state building (easiest access is from 33rd street) you can expect to see a diverse crowd of patrons at this pizzeria at all business hours. 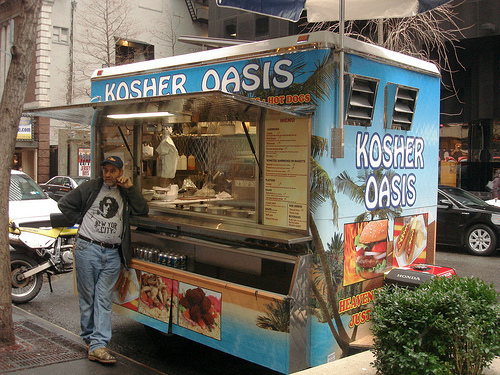 Their variety rivals that of non-kosher restaurants (minus the meat of course). At any given time you can also expect to see about 10 different kinds of pizzas on the table. Today I went with two regular slices which were fresh from the oven and did not need reheating. They were amazing!! The taste of the dough/sauce/cheese just has its own kind of flavor and doesn’t taste generic like most all other kosher pizzerias. At $2.50 a slice its a much better deal than Jerusalem 2 also so why not eat better pizza and save money at the same time. The fresh mozzarella slice however is the best slice they offer and it is amazing, I highly recommend going with it and a regular slice if it’s your first time there. Get a side of ranch from the salad bar and dip your pizza in it – you won’t be let down at the awesomeness that will enter your mouth. Some downsides of this place was that the counter guy was kind of a jerk and impatient with peoples ordering. It also took a few minutes to pay which in the world of hot pizza every minute counts towards freshness. Still – the pizza is amazing and you should definitely go there if you are ever in midtown! PS. Like most kosher places, a dairy restaurant would not be complete with a sushi and salad bar tucked away in the corner and Rosas is no exception to the rule. I have had a salmon avocado roll as well as a regular salad and they were both up to par and definitely a viable option if you do not feel like having pizza.